The Curtis Bench trail is located in the Goblin Valley State Park near Hanksville, Utah. This short trail travels above the various sections of Goblin Valley where hikers can take in scenic overlooks of all the goblins and hoodoos in the valleys below. Just under a mile from the trailhead hikers have the option to follow a spur trail that leads down into the heart of Goblin Valley. After paying the entrance fee follow the road to the first fork in the road where the campground is to the right and the Valley of Goblins is to the left. The trailhead is located at the fork. The sign at the trailhead gives a distance of 3 miles for the hike. The actual trail is only 1.1 miles long one-way. We also hiked down into the valley a short distance and only came up with 2.7 miles round trip so your distance may also vary. From the trailhead the trail follows one of the parks service roads up to the bench area. The Entrada Canyon trail crosses the service road just before the spot where the Curtis Bench trail branches off to the left. 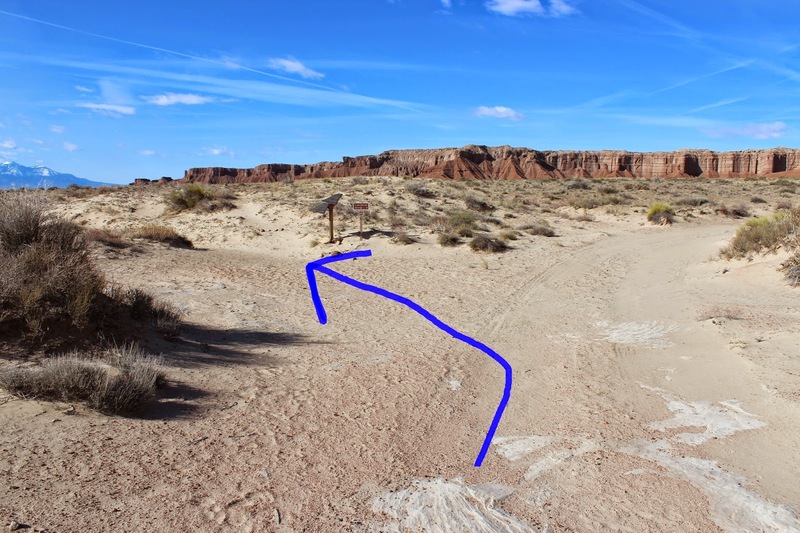 Hikers that are staying in the campground can follow the Entrada trail from the campground to the service road and follow it the short distance to the Curtis Bench trail. Once you get off onto the Curtis Bench trail you will be on an easy to follow single track that has only minor changes in elevation. A fork in the trail comes up just under 1 mile into the hike. At this point you can journey down into the Valley of Goblins. An optional hike would be to hike down into the valley and then pick up the Entrada Canyon trail, near the parking area, and follow it back to the service road to make a nice loop hike. There are good views from an overlook area on the spur trail that don't require hiking down into the valley. Looking over Goblin Valley presents a uniquely beautiful scene. The Tim Allen movie Galaxy Quest was filmed in Goblin Valley. If you watch it before your visit you should be able to spot some of their filming locations. The movie is a very funny spoof of the Star Trek series. Back on the main trail there are distant views of the Henry Mountains to the south and the La Sal Mountains to the east. The trail ends on a point where a brown mylar trail marker reads 'End of Trail'. Wild Horse Butte and its foothills make a beautiful backdrop to the Goblin Valley campground. The campground is very nice but if you want to camp there you will need to make your reservations well in advance of your trip. There are many more camping areas in the area, especially around Temple Mountain, a few miles away, that have vault toilets and plenty of room to camp as well as primitive campsites along Wild Horse Creek. Camping is allowed most anywhere that isn't posted otherwise. While hiking you can't help but to notice all the pretty red and yellow agates and pieces of chert and alabaster. This picture is of a piece of caviar agate. You can pick the rocks up and look at them but rock collecting, or collecting of any kind, isn't allowed in the park so you will need to leave everything there. If you like rock collecting you can find anything that you can within the park, and much more, in the area around Wild Horse Creek that parallels the Goblin Valley Road leading to the park. There are a couple of mining claims in the area that you will need to avoid collecting in also though. The Curtis Bench trail is a good place to take in the views surrounding the Valley of Goblins and to get away from the crowds around the hoodoos. There is a small Visitor Center at the fee station that has several displays and a gift shop. While there isn't a toilet at the trailhead there are flush toilets at both the campground and the Visitor Center. If you would like to see it for yourself then all you have to do is 'Take a hike'.